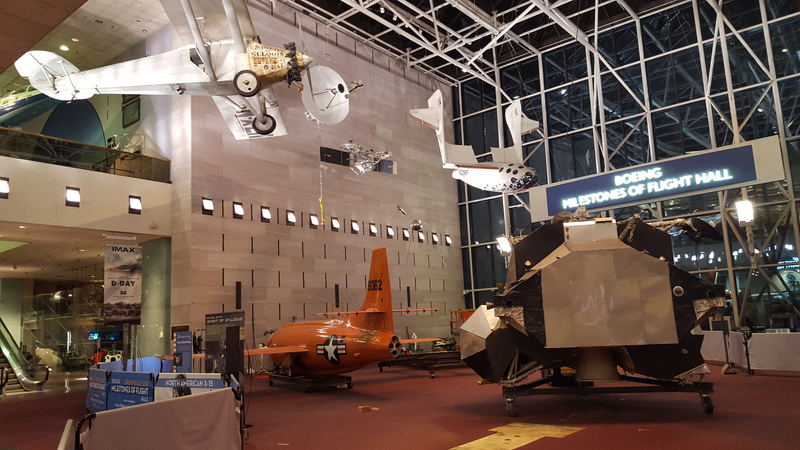 The Smithsonian’s National Air and Space Museum has transferred its Apollo Lunar Module to the Boeing Milestones of Flight Hall, the latest change to an onsite, two-year renovation. The module was moved from the east end of the museum and has been placed in position to create a dramatic centerpiece for the exhibition. This is the first time the module has been moved since the museum opened in 1976. It will undergo conservation and will be reassembled and fully viewable in early 2016. The Lunar Module will act as a striking welcome to visitors as they enter the museum and represent the “milestone” of America’s first moon landing, in July 1969. The Apollo 11 Command Module Columbia, which has been in the Milestones gallery since opening, will move to the Steven F. Udvar-Hazy Center, in Chantilly, Va., for conservation later this year and will eventually be displayed in Destination Moon, another museum gallery scheduled to open in 2020. For approximately two weeks, visitors will have the rare opportunity to see both Apollo artifacts, together, in the same space for the first and only time. Conservation of the Lunar Module will begin immediately and will likely be completed by the end of October, though construction barriers will be put in place in late September, obstructing its view until early 2016. In addition to cleaning and conservation, details will be added to the artifact’s exterior to create a nearly exact representation of the Apollo 11 Lunar Module “Eagle.” Because none of the lunar modules were designed to return to Earth, all modules that are currently on display in the country, including the museum’s, are test vehicles. The lunar module in the museum’s collection has a long history of service and public display. It was used for ground testing prior to the first successful moon-landing mission and displayed in Japan as part of an international exposition in 1970 celebrating the historic accomplishment. The Apollo Lunar Module was a two-stage vehicle designed by Grumman to ferry two astronauts from lunar orbit to the lunar surface and back. The upper-ascent stage included a crew compartment, equipment areas and an ascent rocket engine. The lower-descent stage consisted of the landing gear, the descent rocket engine and lunar surface experiments. The sheer size of the module made it complicated to move and was done in its two phases. Last week, the ascent stage and moved to the Milestones of Flight Hall and the move of the descent stage was successfully completed this morning. The Milestones exhibition, which is the museum’s central and largest space, has frequently changed during the renovation process but has stayed open, and will continue to stay open, to the public. The renovation will be completed in time for the museum’s 40th anniversary in 2016 and will give the hall a streamlined “21st century” look, featuring themes and displays suited to today’s visitors. The National Air and Space Museum building on the National Mall in Washington, D.C., is located at Sixth Street and Independence Avenue S.W. The museum’s Steven F. Udvar-Hazy Center is located in Chantilly, Va., near Washington Dulles International Airport. Attendance at both buildings combined exceeded 8 million in 2014, making it the most visited museum in America. The museum’s research, collections, exhibitions and programs focus on aeronautical history, space history and planetary studies. Both buildings are open from 10 a.m. until 5:30 p.m. every day (closed Dec. 25). The ascent stage of the Apollo Lunar Module moved to the Boeing Milestones of Flight Hall in September 2015 as part of the gallery's renovation. The upper-ascent stage of the Apollo Lunar Module moved to the Boeing Milestones of Flight Hall in September 2015 as part of the gallery's renovation. The descent stage of the Apollo Lunar Module moved to the Boeing Milestones of Flight Hall in September 2015 as part of the gallery's renovation.